How many PDM systems does Solidworks customers need? Product data management (PDM) domain is transforming these days. Back a decade ago, PDM was a system that can introduce an order into engineering chaos, helps to manage files, revisions and collaborate. Engineers didn’t like it much and considered it as a necessary evil. CAD users have a choice between different solutions. These are commonly used options to select PDM – file (means no PDM), PDM system, PLM systems. The last category of systems are usually provides connection to multiple CAD systems. 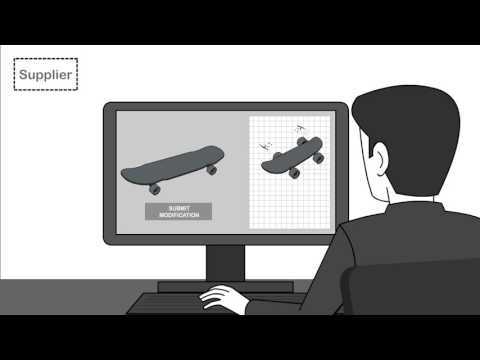 I found an interesting animated video produced by Jim Brown explaining how much PDM you actually need (note – the video was sponsored by Siemens PLM) .It explores the different Product Data Management options available to manufacturers. It explains that value of full-featured PDM as a step beyond CAD File Management and a stepping stone toward PLM for more advanced capabilities as needed. Cloud became a major disruption factor for the past few years. It changed status quo of many systems. PDM is one o them. The new technologies for cloud data management and collaboration introduced an alternative approach to solve CAD file data management problems. In a simple form, you can consider Gmail and Google Drive as your simplest CAD data management option. GrabCAD Workbench was one of the most notable products. Even more, new cloud CAD systems such as Fusion360 and Onshape are leveraging cloud technologies and providing seamless data management functions such as revision management and collaboration. For many years, Solidworks was an interesting market for PDM. Large install base and high diversity of companies provided plenty of options to sell different PDM and PLM solutions to Solidworks users. As a result market end up with few options of PDM solutions available on the market. Some of them are historical and some of them are new and more strategic. The interesting aspect of Solidworks PDM development is that all these systems are eventually owned by Dassault Systemes today. Here is the list of at least five (5) different PDM solutions you available for Solidworks customers today from Dassault. The last one was introduced few weeks ago at Soldiworks World 2016 event. I captured few tweet messages from Monica Schnitger from recent SOLIDWORKS World 2016. She made few interesting remarks about SOLIDWORKS strategy to manage files vs ENOVIA 3DEXPERIENCE strategy for data-driven environment. The following slide (the resolution is not very good, sorry) is giving you some perspective on why you might decide to use ENOVIA for SOLIDWORKS. Back few years ago, I published my article – How to select PDM in 5 simple steps. I think, it is still very relevant. However, for SOLIDWORKS, the decision won’t be easy. There are too many PDM systems owned by SOLIDWORKS / Dassault Systemes and I guess all of them are still supported. Interesting post and one I am sure will generate comments. For many years SOLIDWORKS users have had a choice of data management systems to use. In this time many have come & gone as is the case today. What has changed in the past 5 – 10 years is that DS SOLIDWORKS has taken a direct role in providing this capability. As announced last year, Workgroup PDM is being retired thus resulting in the creation of PDM Standard (essentially a lite PDM Pro) which will provide users with an upgrade path when needed to PDM Professional. So from DS SOLIDWORKS the focus is to provide one data management solution once Workgroup is fully retired. BTW, I can’t say I agree that X-Drive is a data management offering. From the DS ENVOIA side SOLIDWORKS users have a choice here too. This is not to say any user of SOLIDWORKS is a candidate to use ENOVIA. The two solutions are vastly different. One needs to understand the customer use scenario as it exist today vs. what it might be in the future so as to be able to advise. So in conclusion I see two viable data management solutions available today from DS for the bulk of the SOLIDWORKS users community. User needs must be fully understood as one size does not fit all. In the end everyone has options. Hi Patrick, thank you for sharing your insight! In my view, multiple PDM systems for Solidworks is a result of fragmented strategy and misalignment between different groups. Sometimes, it is unavoidable, and Dassault is a good example of such situations.